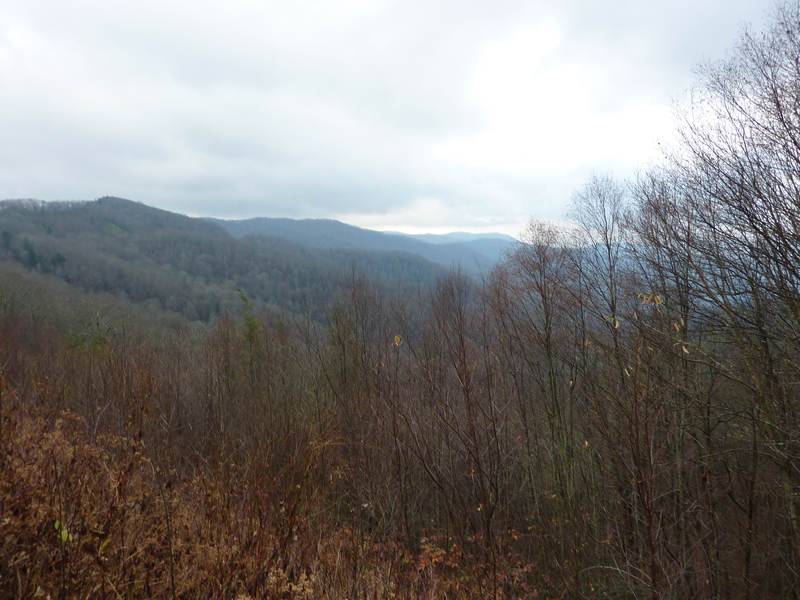 We’d spent the night in log-cabins in the Great Smokey Mountains– a subrange of the Appalachians, in North Carolina. We hadn’t had long there – the stop was largely one of convenience due to the massive distance between Washington D.C and Nashville, but the rural feel and the landscape of endless, browny-green peaks were a welcomed change from the metropolitan environments we had seen so far. That night we’d sat in our rooms eating pizza and getting to know each other better. At this point, we were barely still sure of each others’ names and the conversation was fairly rigid. The next morning we set off to Nashville. The drive out of the mountains had been a long one, full of winding roads and frequent stops at beauty-spots to take photos of the hillsides. No sooner had the Trek Van popped out of the dense woodland, we were in Tennessee, and no sooner had we arrived in Tennessee, we were in it’s capital – Nashville! Nashville is labelled the home of country-music and with an evening of line-dancing on the agenda we knew that we had arrived in LurleenLumpkinville, though on the exterior it certainly didn’t seem the kind of place where cowboys might stamp their stetson-ed boots down the streets in rhythm with their platinum-coiffured cowgirls. Nashville, with it’s tall skyscrapers and watery incisions of the Cumberland River, looked just like any other Western city and initially failed to excite. The group was split at this point – those who wanted to go to the Country Music Hall of Fame (including a trip to recording Studio B) and those who wanted to explore the city. Apparently the Country Music Hall of Fame was an awesome experience and they all got a turn to play on one of Elvis’s pianos. By comparison, our trip to the public library to use the internet wasn’t quite as exciting but hey, at least I was able to send that e-mail… Indeed, walking around Nashville during the daytime was a somewhat flat experience, even the much-heralded Broadway was not as lively as we anticipated, as we ended up stood next to the Convention Centre for around half an hour urging the others to come back so that we could get to the hostel. 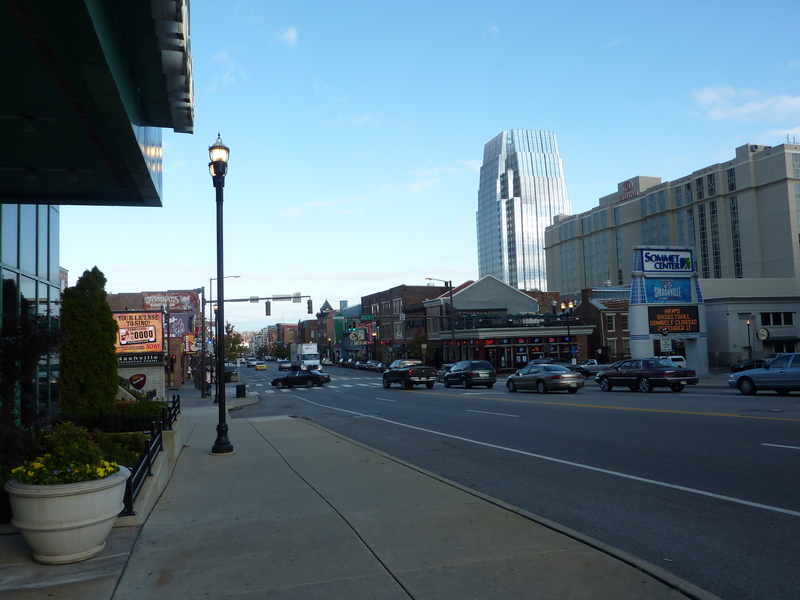 What we didn’t realise, was that Nashville was very much a nocturnal city which slept during the daylight, and once we’d checked in and deposited our luggage at the overtly quirky Music City Hostel, it was ours for the taking! It was Kirsty’s birthday that day, and we were all very much in the spirit of partying. As the cab sped through the streets like a nippy yellow bullet to take us to The Wildhorse Saloon on 2nd Avenue North, we were amused to hear Miley Cyrus’ ‘Party in the U.S.A’ on the radio. “So hard with my girls not around me, definitely not a Nashville party!” the others sang along with Nashville-born Cyrus, knowing the lyrics better than I did. I looked out of the window at the way the pavements buzzed underneath the glow of neon signs and was definitely, by this point, feeling Nashville. The Wildhorse Saloon was huge, absolutely huge, built upon three levels with 66,000 square feet of space solely for eatin’ and dancin’! A life-size model of a horse on it’s hind-legs, decked out in a cowboy waistcoat and neckerchief, had greeted us upon arrival, which instantly gave off the impression that this was going to be a somewhat lively, off-the-wall experience. Inside the place was buzzing, and a man sat on stage strumming his geeeetar whilst we took our seats at high tables and perused the menus. Money and stomach-lining permitting, I would happily have ordered the entire listing, so tasty everything looked. In the end I opted for the rack of ribs served with beans, southern coleslaw and Texas toast, followed, of course, by birthday cake. 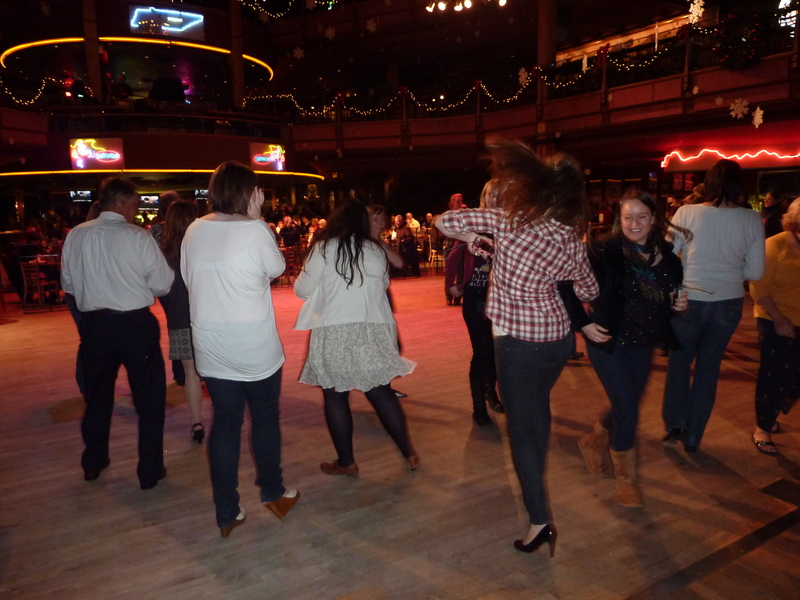 As were finishing our meal, the line-dancing lesson was beginning to take place! A young girl who fit the Lurleen Lumpkin stereotype perfectly was ushering everybody to the dancefloor. “Come on y’all!! Time for some line-dancing fun!” and, albeit with slight reluctance, we made our way to the centre of the hall to join in with the fun. There were probably a hundred or so people on the dancefloor – men and women, old and young. Lurleen Lumpkin, as we shall refer to her as for simplicity’s sake, lead the way with enthusiasm and encouragement. The steps ranged from the basic to the more advanced, and somewhere in between the two was the funky chicken. 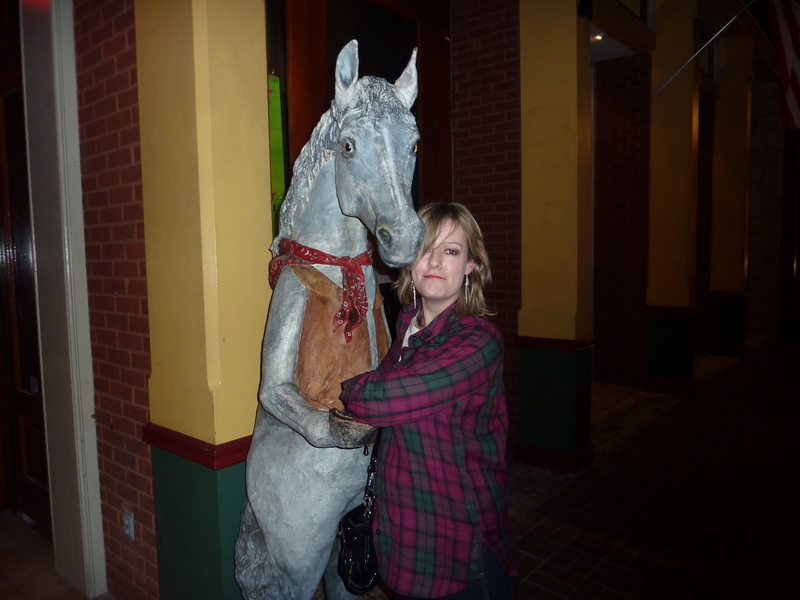 I felt quite at home in my plaid shirt and denim jeans, though was unable to keep up with the dancing for long and eventually made my excuses about being out of breath and in need of a beverage, so returned to the table. Plus, there was a cake to consume. When we left the restaurant we strolled a somewhat drunken stroll along Broadway (now much more lively!) 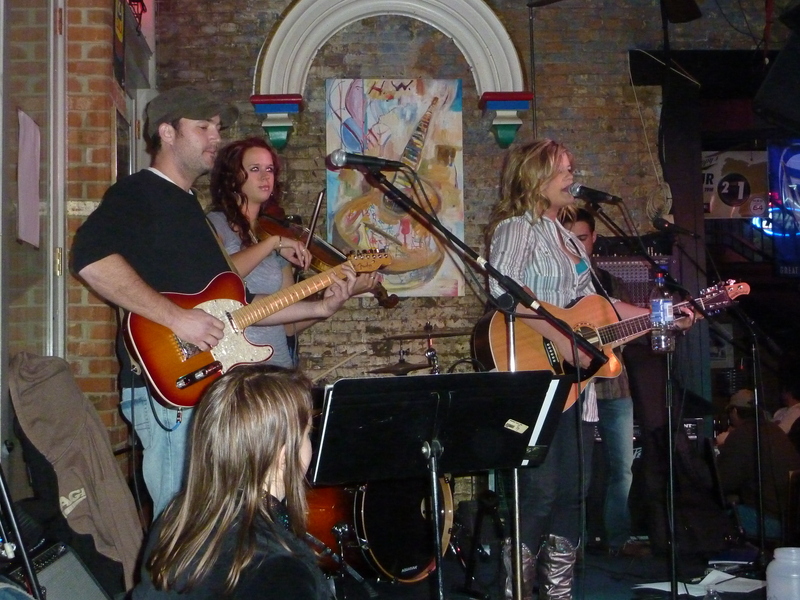 and ended up in Rippy’s Bar & Grill where blonde Kentucky darling Kinsey Rose was performing a gig with a backing band of guitars and violins. For an hour or so we soaked up the authentic country atmosphere and tapped our feet in the rhythm of her songs. Mindful of our early rise the next morning, we left the bar at around 11pm and made our way back to the hostel. We took a taxi, the driver of whom proclaimed himself as the best cab driver in the whole of Nashville yet who ended up taking us on an impromptu tour of what seemed like the whole of Tennessee. 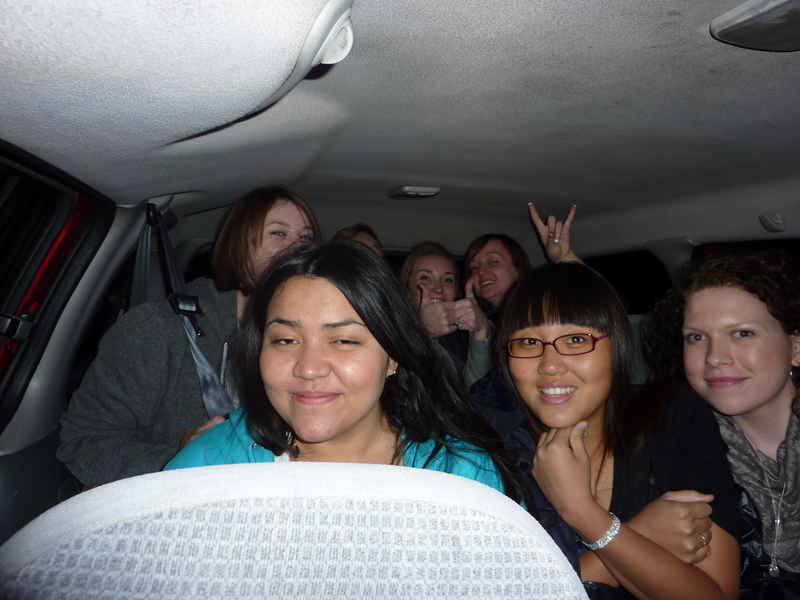 As panic eventually began to set in, that this crazy man had a car full of 8 foreign girls, we conceded in calling Mandy for directions back to the hostel. It was probably by pure luck that we were able to recognise the low-rise building and hammock on the front lawn which comprised the accommodation we had seen only once, briefly in the afternoon, but as the last of us made our escape out of the taxi the sense of relief was huge and the adrenalin rush kept us awake for a further hour or so. Nashville, definitely a place best experienced at night!